Walk into this lovely maintained condo unit on the top floor of the building. Pride of ownership shows throughout. Nice sized kitchen with updated cabinets and breakfast area. 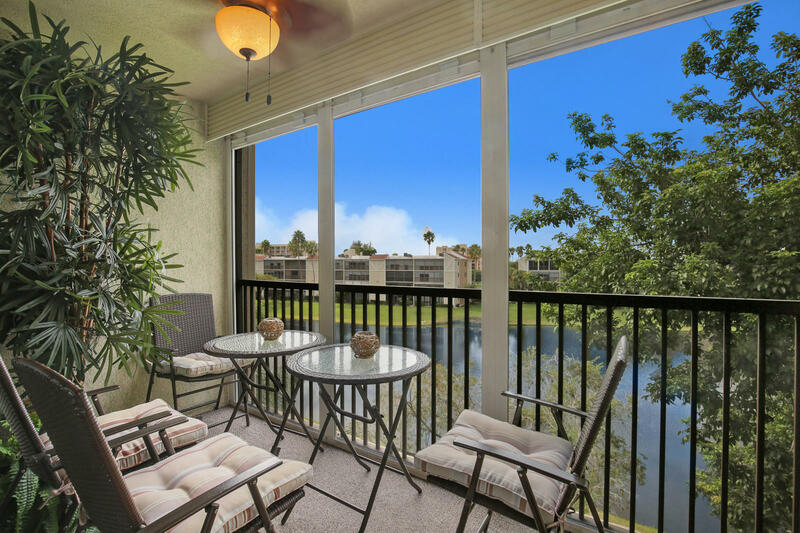 Large living and dining areas w/ beautiful wood flooring that leads to a long lanai overlooking the beautiful lake. Great bedroom with its own private bath also leads out to the Lanai. Another nice bedroom with second bathroom. Ceiling fans throughout unit. Hurricane shutters in front of unit. Huntington Lakes is a very active 55+ community with all kinds of clubs, social and athletic activities. Pickleball is a must have. Section one has a beautiful pool, spa, BBQ and their own clubhouse. This is a must see.